It's just not the holidays in New York City until you've witnessed, with your own eyes, a baboon tearing into a box festooned with wrapping paper, big red bows, and the occasional tinsel swag, as a crowd hopped up on hot cider eggs it on. Three of the city's zoos run a program through December called Wild Holiday Party: Presents to the Animals (which sounds like a Japanese translation of something): at the Central Park, Prospect Park, and Queens Zoos, visiting with the animals on weekends in December virtually guarantees you'll be treated to the patently absurd sight of exotic life forms opening presents. You know, just like their species has done back on the tundra for tens of thousands of years. While kiddies and grown-ups alike delight at this weird tradition, the big question is: What's in it for the animals, other than blatant public humiliation? 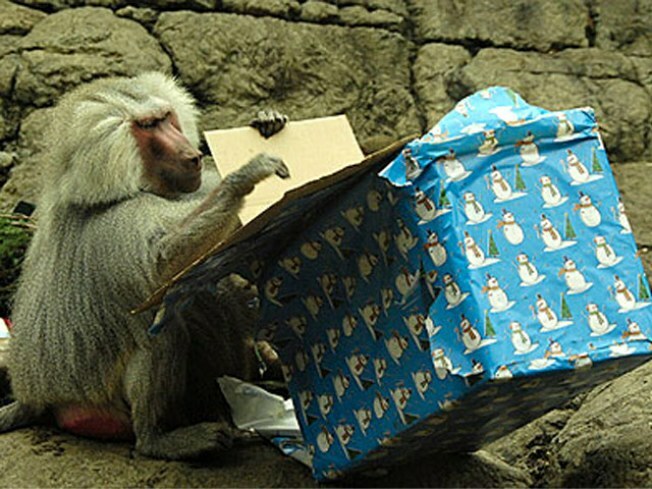 Zoo staffers pack the presents with incentivizing treats like frozen fishsicles, live trout, peanut butter, red meat, apples, and the like. But for extra hilarity, try imagining that that polar bear is opening an iPhone or some Victoria's Secret lingerie.